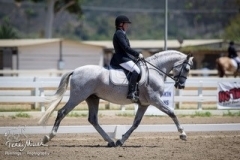 Panadero, a Pure Spanish Horse from some of the best Spanish studbook bloodlines, is honored to be a Spokes Horse and an Ambassador for Omega Fields’® nutrient dense supplement, Omega Grande®. Panadero has been on Omega Fields products since he arrived from Spain. 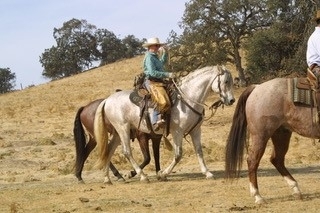 Tari, my Palomino mare, has been on the product for many years and her coat is so shiny and healthy. I really like how I didn’t have to feed my horses psyillium anymore to prevent sand colic. 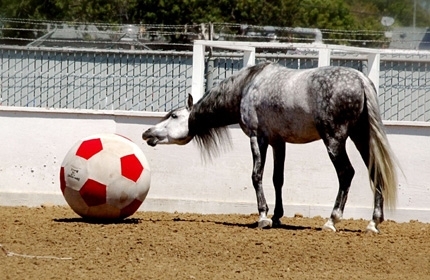 Panadero loves the taste of Omega Fields products. We use the Omega Nibblers® treats as part of his training at Liberty. His coat, mane and hooves are so healthy. He even shines when he is dusty and dirty from rolling. Julie Krone, a member of Panadero’s fan club said, “We all have to wear sunglasses around these horses because they’re so shiny.” The Omega Fields stabilized ground flax based products are very high quality and are very affordable. I’ll always use Omega Fields’ products! Panadero XLVI, the legendary Pura Raza Española stallion of Liberty Exhibition fame, experiences the beach for the first time with trainer Margit Deerman and owner Lisa Alley-Zarkades. 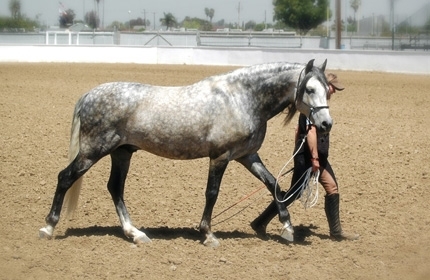 Panadero is a Pure Spanish Horse, or P.R.E. is a rare breed not often seen in the United States and is one of the oldest breeds in the world today. 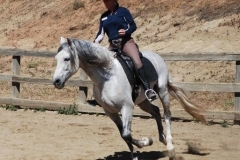 Born in 2002, Panadero’s journey from Spain to the U.S. was the accomplishment of his owner’s dream and passion for this special breed, it’s temperament, versatility, athletic ability, and intellect. 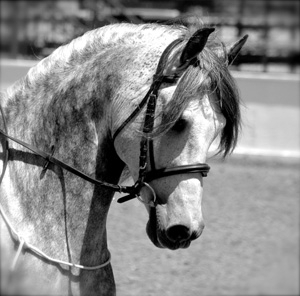 Photos of Panadero, a Pura Raza Española stallion, from a recent photoshoot in Southern California. 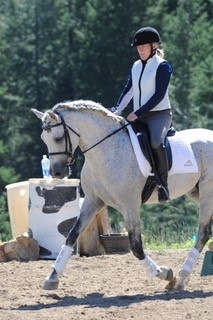 My journey with this horse since 2009 has been a great learning experience. 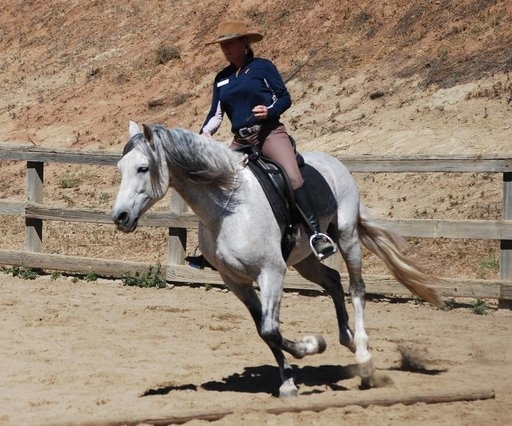 After he got through level 4 in the Parelli Program Lisa and I decided to see how he would do in Dressage. We were amazed. 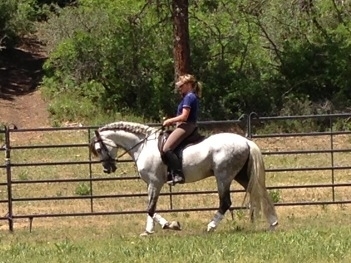 Not only was I learning dressage but training him as well. 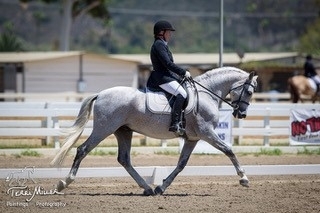 We won All Around San Diego Open Dressage Champion three years in a row. In 2015, we got our Bronze Medal. A huge accomplishment for both of us. 2017 we are getting ready to show in Open 4th Level division. I believe that giving him variety is the key for him. He can go one day and rope cattle at a branding and the next day show in dressage and the next day ride bridleless on the beach. He is so willing and such a great partner. I am forever grateful of this precious gift. 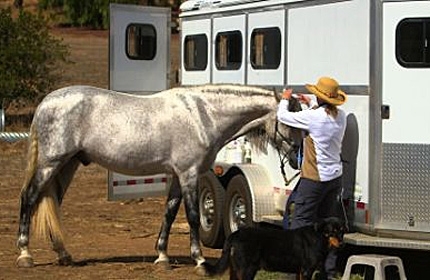 Panadero has been on Omega Horseshine since he arrived from Spain. We also use the Omega Nibblers treats for training purposes. 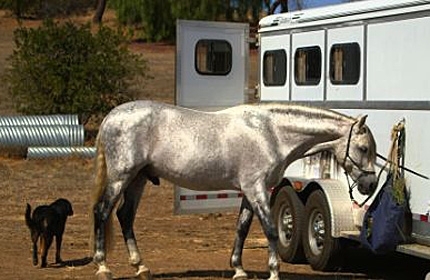 Since using Omega Fields® products, his coat is very shiny (even for a grey horse! ), his hooves are very strong and healthy, and his mane is long. Panadero XLVI has been a loyal Omega Grande® Ambassador for many years now. His photographic beauty in films and pictures have shown off his amazing shimmering silver shine. 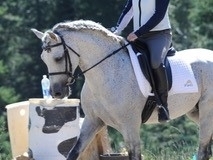 He gets many compliments regularly on his beautiful shine as his coat color evolves each year. 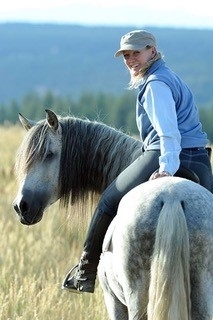 Panadero’s long time trainer and partner is Margit Deerman 4 Star Senior Parelli Professional. 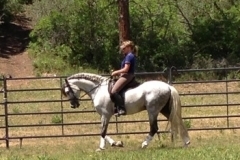 She has taken Panadero to Level 4 in the Parelli Program. And he has been a guest at the Parelli Pagosa Springs Ranch several times. 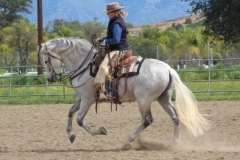 Linda Parelli has ridden him while at her ranch. She has always been very complimentary of his behavior, temperament and beauty. Omega Grande Complete and Parelli natural horsemanship have been our winning combination. I am always getting complements on his shine. Even when he is not bathed his coat is healthy and shiny. That fall, Lisa received the famous auction flier from Cardenas for a live auction at SICAB (the Spanish National Horse show for the P.R.E.). She logged onto the website and watched young P.R.E.s being paraded around by men in traditional costume while Spanish guitar music was played. Seeing the starting auction price, Lisa thought perhaps she could afford one. Panadero was born May 14, 2002. 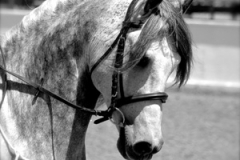 His sire was Jaguar V, Champion of Champions at SICAB and a gold medal winner for his age class at SICAB. His grandfather was Leviton, one of the most famous P.R.E.s in the history of Spain. His grandmother was Taifa, also a Champion and a gold medal winner of Spain. She was by Vasallo II, again one of the most prized P.R.E. sires in the history of the breed, having set a record point score at SICAB. Lisa asked Pedro if they had ever sold a P.R.E. to a Californian. 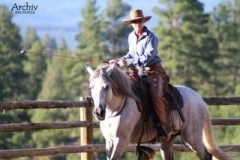 He said they had sold one to a man named Ronald Reagan for his famous ranch in California. 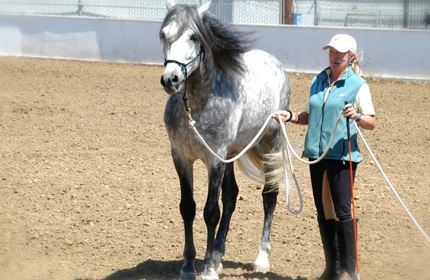 Shelly Martin, who had been Panadero’s trainer, was there helping Lisa. 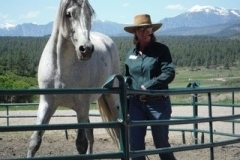 Shelly, a previous National Cutting Horse Association World Champion trainer, had been working with Carolyn Resnick learning her method of liberty training. 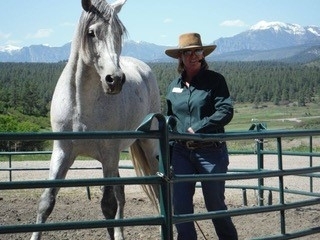 Within a month of working with Panadero, Shelly realized that a lot could be gained for both she and this young stallion by working more closely with Carolyn. 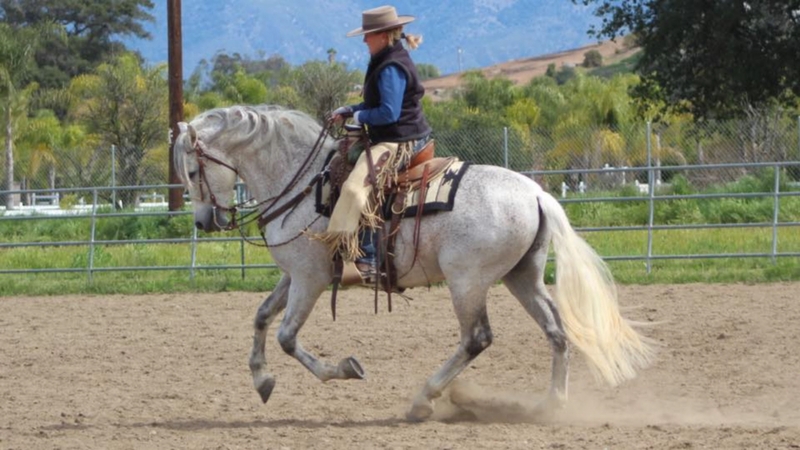 Before long Panadero was living at Carolyn’s ranch in Escondido , Calif., where both he and Shelly were immersed in her liberty work known as “Beyond a Whisper,” a method where the horse is not restrained in any way. 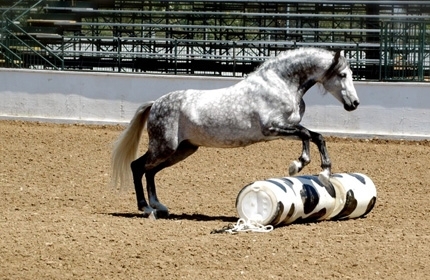 This method does not use any tack, bridle or saddle—and many times not even a halter. 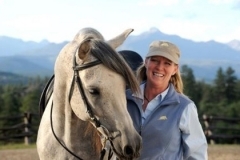 Carolyn’s even written a book titled, “Naked Liberty,” which is about her life with wild horses and what she’s learned from observing herd behavior. Interestingly, and somewhat prophetically, Carolyn commented that she felt Panadero was special and that he was going to be famous. Carolyn did some filming of her work with him during his stay. That filming is now part of Carolyn’s DVD collection. Also, some of the filming is included in the documentary film, “The Path of the Horse,” by Stormy May (which has won film festivals awards). Shelly took over his main training in November 2007. She has since done a number of exhibitions with him. With his photo on a credit card and on Omega Fields’ Omega Grande bag, as well as being chosen as an ambassador for the Omega Grande product, being a star in a documentary, and having his own fan club and website, he’s already well on his way. Perhaps a Hollywood contract is next? UPDATE MARCH 2017: Panadero was gifted to Margit Deerman Christmas 2016 by Lisa Alley-Zarkades.